Easy to adjust absorbency as required with extra inserts. Outer and inserts dry quickly. Stretchy elastic at legs and waist for good containment. Smaller sized pocket nappy with gussets, ideal to use from birth where a standard one size pocket nappy will swamp a newborn. Pocket system with choice of inserts, either microfibre and/or Slimma Stuffs bamboo/microfibre inserts included for absorbency. Easy to adjust absorbency as required. Leg gussets to minimise leakage. Choice of Aplix hook and loop, or popper fastening. One size, adjusts to fit from birth to potty. FuzziBunz Pocket nappy, includes one microfibre insert (sized version) 2 inserts (one size version). Outer has no absorbent components and dries very quickly indeed. Absorbent Microfibre insert dries very quickly. Popper fastening, adjusts to fit. One Size FuzziBunz has adjustable elastic at waist and leg. Available in white and a choice of colours. 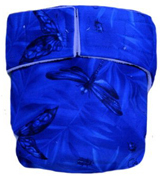 Pouch system means any absorbent nappy/insert can be inserted for absorbency. Aplix brand hook and loop fastening. Available in white and a choice of colours in laminated 100% polyester outer ideal for heavy wetters or overnight. Available in choice of prints in laminated 100% cotton outer best suited to day times. Fleece rolls outwards at leg cuffs to for a good leakproof seal. Choice of One Size (adjusts with poppers) or the trimer fitting Multi Sized, 3 sizes usually required from birth to potty. Aplix hook and loop fastening. Available in choice of colours. Multi Sized, 3 sizes usually required from birth to potty.